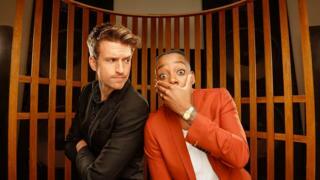 Greg James and A.Dot have been announced as the hosts of a new, primetime music show on BBC One. Sounds Like Friday Night will be the first regular, mainstream music programme on the BBC since Top of the Pops was cancelled in 2006. Broadcast live from Television Centre, it promises to feature "the hottest bands and artists in the world", alongside interviews and sketches. Brit Award-winners Royal Blood have written the show's theme tune. "We always imagined doing something like this one day," said the band. "It's great that a new show celebrating live music is back at the BBC and creating a home for new bands to build a bigger audience. We're excited to be a part of it." The show will launch in October. James, who got his break in student radio, has hosted Radio 1's drivetime show since 2012, and reveals the Official Charts every Friday. A.Dot is the stage name of Ashley Charles, a rapper who has performed with Busta Rhymes and Missy Elliot. Also known as Amplify Dot or Dotty, she currently presents the 1Xtra Breakfast show, where she has become known for her Prank Calls feature. The two hosts will be joined by a different guest star every week, who will take part in sketches, as well as performing live. The format seems similar to Adele at the BBC - which featured a viral sketch in which Adele auditioned to play her own lookalike. "We have been missing a primetime music show from our TV screens for far too long so it's fair to say being part of Sounds Like Friday Night is something I'm really, really excited about," said James in a statement. "One thing that's fantastic about the show is being able to provide new and emerging acts a home alongside the megastars, introducing them to a new audience." The new show is being produced by Fulwell 73, the company behind James Corden's US chat show and Carpool Karaoke sketches. It has been in development since 2014, as the corporation searched for a music show format that worked. "Pop music has no divine right to be on BBC One," BBC Music boss Bob Shennan told Music Week earlier this year. "The reality is that, if you stick a succession of performances on one after the other, and there's nothing special about it, it's not necessarily going to attract the audience." "We want to open [artists] up so you see them for who they are and have fun with them," said Gabe Turner of Fulwell 73. "With the sketches, it's not just presenting a song, but experiencing their world." "I'm thrilled to be part of Sounds Like Friday Night," added A.Dot. "Each week I'll be meeting fellow music fans from around the UK, getting the lowdown from the viewers on social media and bringing the best music to you at home. I can't wait!" Sounds Like Friday Night has been given an initial run of six episodes - neatly echoing Top of the Pops, which was commissioned for half a dozen episodes in 1964. That programme ended up running for 42 years, registering its highest audience in 1979, when more than 19 million people tuned in to see Dr Hook's When You're in Love with a Beautiful Woman topping the chart. But by 2002, it had lost millions of viewers to 24-hour music channels like MTV. The show was eventually shunted to BBC Two before being cancelled. Music has continued to play a key role on BBC Four, with archive espiodes of TOTP appearing alongside music documentaries and the new Live Lounge show, which compiles the best live acts on BBC Radio 1. On BBC Two, Later... With Jools Holland is celebrating its 25th anniversary, while coverage of Glastonbury, T in the Park and the Reading and Leeds festivals are televised throughout the summer. The music industry has received the new show enthusiastically. "The BBC is a fantastic supporter of British music across its radio output, and we have been encouraging senior BBC executives over the last few years to step up and do more to showcase Britain's amazing music culture to the nation on television too," said Geoff Taylor, head of the BPI, which represents the UK's recorded music industry. "We are thrilled at this new opportunity for some of this country's unique talent to reach a mainstream TV audience. We wish the series every success in the hope that it will become a long-term fixture on our screens. With Greg James at the helm it should have every chance of doing well."